Has worked with Franck since 1992. Although Patrice was educated in architecture and design, he has mainly worked as a diver in archaeology and as an archaeological illustrator, including riverine archaeology projects for DRASM, the French underwater archaeological department, and for the Musee de Chalon sur Saone, one of the first underwater archaeological excavations to take place in freshwater. Patrice was born on a boat and loves everything about the water, especially discovering the past underwater. He is at his happiest when he’s on a boat, working. 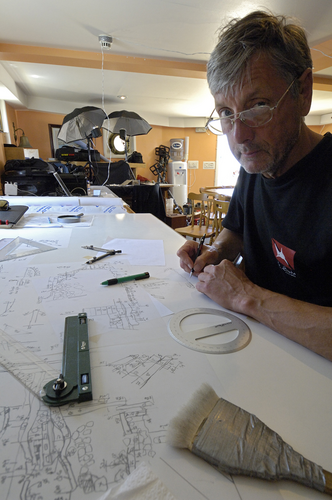 Patrice does all of our fine drawings and maps of the projects – a very important part of the process. Apart from illustrating building construction, port infrastructure, and stratigraphy underwater, Patrice particularly enjoys working on shipwrecks, where you have a concentrated view of life, a “time capsule”. He likes to study the wooden structure of the boats.